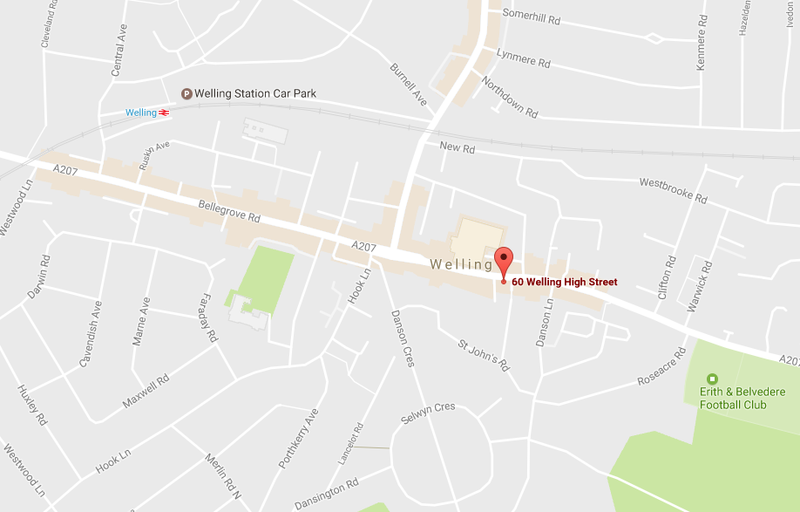 Medidenta Dental Practice is located in the heart of Welling High Street, Kent. By Train: Closest train station is Welling station. There is a 12min walking distance from it to our dental practice. Walk west on Station Approach towards Central Ave, Turn Left on Central Ave and wlk for a bit and Turn left again onto Bellegrove rd. Walk straight till you find big Tesco and our Medidenta Dental Practice is next to them. If you are coming from Bexleyheath Train station, take Bus Nr B15 to Upper Wickham Lane and walk for few minutes through Welling High street to the practice. By bus: Bus Number 89, 486,96, B16 go to Upper Wickham Lane which is 2-3min away from the dental practice. There is free street parking further down on Danson Lane.